Inspired by many South Korean businesses and investors making a splash in Vietnam, many South Korean financial institutions are seeking to further invest or shore up their operations here. And it is not only South Korean businesses, but local ones too that such investors are aiming at. The domestic economy has grown tremendously over the past few years, with South Korean direct investment in 2017 standing at $3.97 billion in registered capital, second only to Japan, according to the General Statistics Office. As a logical consequence, South Korean financial institutions have increasingly gained footholds in Vietnam to cater to the financial needs of foreign direct investment (FDI) businesses and investors. Nine banks including two local corporations and seven branches or representative offices, five securities firms, two leasing companies, and three finance companies from South Korea have so far joined the local banking and finance landscape. The past year saw an upturn in the presence and operation of South Korean financial institutions in Vietnam, evident in wholly foreign-owned Shinhan Bank Vietnam acquiring ANZ Vietnam’s retail banking business, KB Securities buying 99.4 per cent of local Maritime Securities Inc., or Shinhan Card and Lotte Card taking over Prudential Vietnam Finance and Techcom Finance Company, respectively. For these ambitious financial institutions, serving the South Korean community is only one of their priorities. Further tapping into the sizeable chunk of 70 per cent of the population that is unbanked or underbanked is definitely another attraction. Shinhan Bank Vietnam, upon its successful takeover of ANZ Vietnam’s retail banking business in 2017, proved its consistent strategy to grow both its corporate and retail arms, with 30 branches to date, dominating the sales channels among foreign banks nationwide. Shinhan Bank Vietnam CEO Shin Dong Min told VIR on the sidelines of the 7th International Finance Conference held in late March that while the bank originally targeted South Korean businesses in Vietnam, its strategy has changed over time, with an extended focus to also include local corporations and retail customers. “We realised that our customer portfolio consisted of only South Korean companies, so we want to change that. We’ve tried to support local companies for nearly 10 years. We also want to attract some Vietnamese retail customers. So we’re now trying to achieve a balance between the corporate and retail sides of our business,” said Min. Meanwhile, competing with local banks in the retail segment will pose a difficult task to foreign banks. Shinhan Bank, however, aims to differentiate itself by digitalisation, with the bank planning to collaborate or partner up with fintech companies to create optimal solutions for their retail customers, the CEO added. While there are presently around 6,500 investment projects in Vietnam originating in South Korea, with accumulated capital registered at some $58 billion, the share of these investments that made their way into the finance and banking sector in Vietnam is rather small, according to Nguyen Anh Tuan, editor-in-chief of online portal Nhadautu.vn. “The merger and acquisition (M&A) deals and equity investments in the banking and finance sector that South Korean financial investors have conducted in previous years are relatively small in quantity and quality,” Tuan said at the International Finance Conference. Tuan noted that the sector carries a multitude of prospects and opportunities for foreign investors, as the country is aggressively pushing the equitisation of state-owned enterprises (SOE), while the private sector is also offering a great deal of stocks listed on the stock exchanges for investment. “The local banking sector is going through a restructuring process and as you can see, a number of troubled banks have been restructured. Some of them are on the negotiation table to sell to investors, including foreign ones,” he said. Seo Jae Seok, deputy general director of Woori Bank Vietnam, said that an environment like Vietnam’s – with a bright outlook of the local economy that scored 6.81 per cent in GDP growth last year and the improved financial and banking structure – is enticing to foreign investors, including South Korean financial institutions who could be looking to invest in the financial and banking sector in Vietnam. 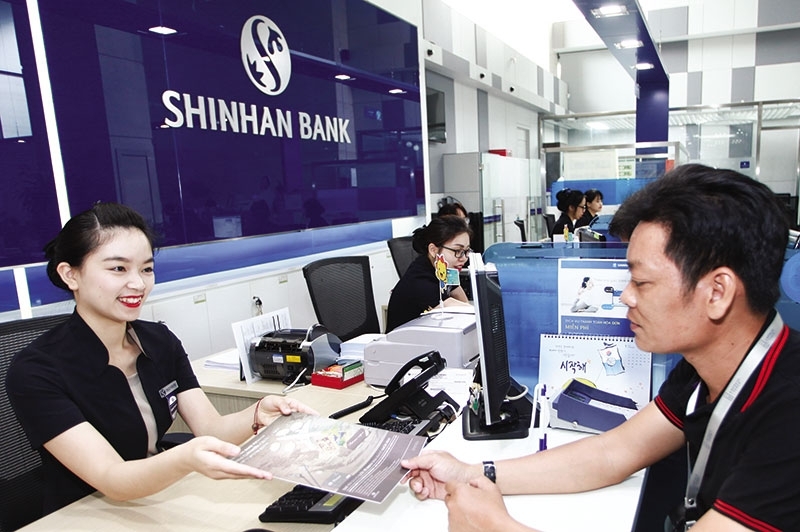 Retail banking, according to Min of Shinhan Bank Vietnam, is considered a promising segment that South Korean investors can look into when deciding to invest in Vietnam, with risks associated with the capital needed to invest in the sector. “Nevertheless, this can be the area to incorporate the digitalisation trend that we see happening in the banking sector. For South Korean banks who have a solid know-how on digitalisation, investing in retail banking with its digital features will be of advantage in this case,” Min noted. For South Korean investors that are seeking a way into the local banking and financial market, there are several ways to go, including gaining a licence to become a local incorportation like Shinhan Bank Vietnam or Woori Bank Vietnam did, or through M&A activities. The former, according to Sung Mee Hong, partner in the corporate and M&A practice group at South Korean law firm Lee and Ko, is getting increasingly hard, as the local banking market has hit the saturation point with too many banks on the scene. The latter, as such, will be an alternative for investors to enter the market. “Nevertheless, the foreign ownership limit (FOL) in the banking sector – at 20 per cent for a strategic investor – still poses an obstacle for foreign investors,” stressed Hong. “Given such limits, a foreign financial institution investing in a local bank does not have the right to veto votes or have a say in the management of the bank. “Of late, the Vietnamese government has allowed foreign investors to take over 100 per cent of distressed banks. This will become another way for foreign investors to enter the market, killing two birds with one stone: paving the way for foreign investment into the sector and helping troubled banks to regain their lost reputation,” she added. In the opinion of Moon Kyung Kang, general director of Mirae Asset Securities (Vietnam), South Korean investors are “usually very interested” in the banking sector. However, unlike strategic investors that buy bigger shares in local banks, general investors would rather invest in small portions of bank stocks. “But in case of strategic investors, when they buy the big shares [in local banks], they want to be a part of managing the company. But the portions of 5 per cent or 10 per cent are really small, so the investor has no power to manage the bank,” said Kang in an interview with VIR. Under current regulations, the FOL in the banking sector is capped at 30 per cent, with a 15 per cent limit for a non-strategic investor, whilst a foreign strategic investor can hold up to 20 per cent of a domestic bank’s stakes, granted by the government on a case-by-case basis. This cap can be a challenge for foreign investors who want to acquire large stakes at local lenders, according to Kang. While South Korean financial institutions are yet to become prominent in the local banking and financial landscape, they are working their way to expanding operations and venturing into co-operations with local banks. For instance, while Hana Financial Group is in the pipeline to buy a 10 or 20 per cent stake at state-owned BIDV, its subsidiary KEB Hana Bank’s Ho Chi Minh City branch has received approval from the central bank to double its chartered capital from $35 million to $70 million.